Pakistani star batsman Fakhar Zaman is expected to be ruled out of the third test match against New Zealand due to knee injury. Despite the team’s efforts in winning the matches against New Zealand, it’s like the universe is conspiring against the Pakistan team. 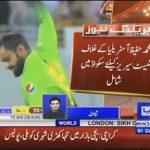 After the injury of Abbas which has ruled him out of series against NZ and most probably against South Africa too, it’s Fakhar Zaman who is now handling his knee injury, ruling him out of the series as well. We are depressed and stressed about the third test which is going to be the deciding test for both teams. After an incredible win in the second test against New Zealand, the Pakistani team seemed in high spirit and pretty much set to do everything possible to win the third test. But with these injuries, things seem a bit tough despite Yasir Shah’s brilliant performance in the second test. There’s only so much one can do every single time. Just a throwback to second test, where Yasir Shah took 14 wickets in the test match, equalling the record of our dearest Prime Minister Imran Khan. An innings win and this feature, seems like someone’s “nazar” got our boysis. 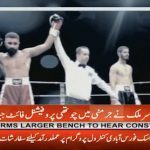 Pakistani Boxer wins 4th Professional Fight.